Even after all these years, there is an indescribable feeling that comes over me when I harvest something from my kitchen garden. Maybe if you took enormous scoops of joy, passion, pride, excitement, exuberance, hunger, & delight, and then tossed them all together in a bushel basket you might come close. But only close. 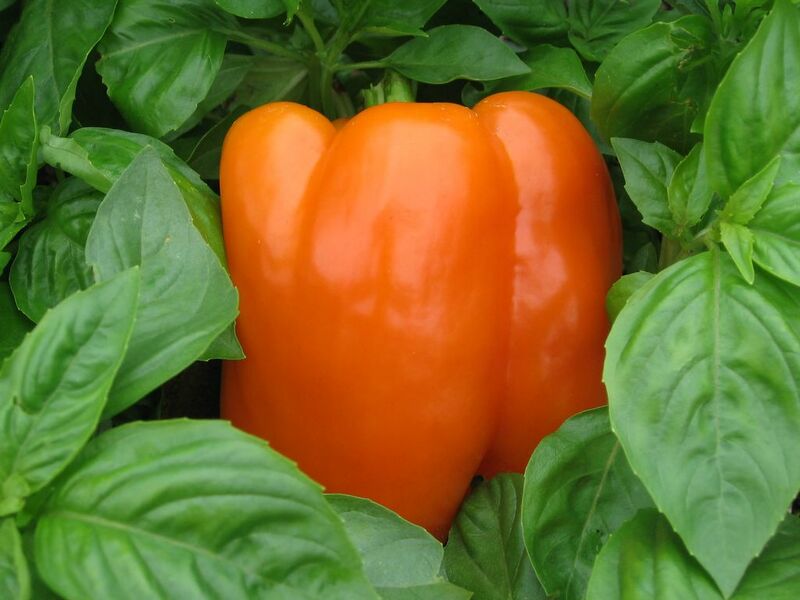 For you really must rub your fingers across the smooth, almost unreal surface of this sweet bell pepper. And bury your face in the scent of basil. And be blinded by the jewel-like colors of high summer. Only then can you truly begin to feel it. The thrill of the garden. The simplicity of absolute bliss. It is also difficult for me to describe just how rewarding it is to hear from so many of you who have been inspired by Farmgirl Fare and In My Kitchen Garden to get your hands dirty and grow something edible--whether that meant tearing up half your backyard and filling it with vegetables or simply sprinkling a few lettuce seeds in a windowbox. Thank you for letting me know. May your gardens and your enthusiasm continue to flourish. And may you always find your bliss. I can almost taste that delicious looking, freshly picked pepper. Wish I lived closer, so that you could share. LOl! Nana Texas in a cooler Texas with a recent bit of rain! That is one beautiful pepper! makes me wish i could just take a deep breath of that sweet smelling herb and pepper. I bet they tasted better than the picture let on! i adore the small of basil. i have three plants and they don't look anywhere near as beautiful as yours. Look at your frisky basil! Ugh, mine did not turn out this year. Weird, too since I've never had a problem with it. Oh well, we forge ahead. Even when the garden doesn't do what it's "supposed" to do. Which is why we love to garden afterall - the surprises. The photo is gorgeous, but the paragraph perfectly and eloquently expresses how all of us feel that know the joy of garden creation. (I wish I had written it!) Thank you. beautiful post. Really appreciate the last two lines - very simple, beautiful, almost a blessing, in a way. Love how inspired you are by the things around you. May you always find such beauty in all that you do. Gorgeous Farmgirl. Basil is the scent of summer for me. Wonderful, stunning post. You bring the produce alive on a regular basis. I love your gardening photos! I am finally coming to terms with what I can and cannot grow in my garden. We have rocky clay that gets like concrete when it's dry. I am slowly trying to improve it but... So, carrots are a 'no' (2 inches wide by 1 inch long) but lettuce does great! Now, if someone could only figure out how not to have everything ready at once! Yes, I tried staggered plantings - the early plantings waited for their friends...So, we just eat veg. for 3 weeks and I fill my 'vegetable freezer'.